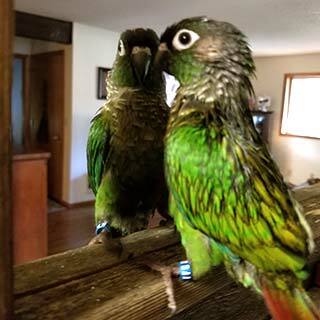 This conure gets excited to see what she thinks is another bird. Because you can't ask animals what they think about, the classic way to study self-awareness in animals is with the mirror test developed by Gordon Gallup, Jr. in 1970. To conduct the test, an animal's body is secretly marked, for example by placing odorless red dye on the face, and then the animal is given access to a mirror. If he understands he is looking at himself and not another animal, he might touch the mark while looking in the mirror or turn his body to better see the mark's reflection. That would indicate self-recognition, which hints at self-awareness. Self-recognition in a mirror may seem obvious to humans, but it requires cognitive sophistication. We are not born with the ability to recognize ourselves in mirrors. Young infants may be fascinated by their reflection, but they view this as a social interaction with what appears to be another baby. Somewhere between the age of 18 and 24 months, babies begin to understand that they are looking at themselves in a mirror. Over the years many psychology experts have used the "mirror test" to determine whether an animal is self-aware to the level that humans are. Only a few animal species have passed the test. Surprisingly, dogs are not one of them. Elephants, dolphins, orcas, chimpanzees, orangutans, and European magpies have passed the reflection test. Pigs haven't passed it, but they can use their reflection to locate food that's placed behind them. Surprisingly, gorillas have not passed the test, and this may be because gorillas consider eye contact an aggressive gesture and normally try to avoid looking each other in the face. At least one specific gorilla, Koko, did pass the test. Many dogs, cats, birds, and even reptiles like lizards may react oddly when they see their own reflection, either trying to play with their reflection or even attacking it. Cats also haven't passed the mirror test, and it seems that they have the most consistently violent reaction to seeing themselves. When they see their reflection, they think they're seeing another cat. Because cats tend to be territorial, they may react by puffing themselves up and trying to defend their territory from the new intruder. Many people are puzzled by the fact that dogs seem to ignore images of themselves reflected in a mirror. This lack of understanding seems surprising, considering the other complex mental and social skills dogs possess. Dogs are highly intelligent, extremely social, and fit right in with human households, even to the extent of voluntarily learning to recognize the meaning of human words. Anyone who saw the 60 Minutes segment on border collies knows that these clever dogs are extremely attentive to the needs of their pet parents. One collie had a large collection of about 1,000 stuffed toys that he could retrieve on demand. It suggests that the dog has a clear grasp of his companions' intentions, hinting that a capacity for self-awareness is not unthinkable. When young puppies encounter mirrors for the first time, they treat the image as if it is another dog. They may bark at it or give a little bow and an invitation to play as if they are encountering a real dog and engaging in a social interaction. However, after a short while they lose interest. As adults they often seem to treat their reflections as if they don't see themselves or as if it's of no consequence. The conclusion that researchers drew from the fact that dogs fail the mark and mirror test is that dogs lack self-awareness, and thus consciousness. Another conclusion that could be drawn is that dogs recognize that that is their own reflection, but they are simply not as vain and concerned with their appearance as higher primates. Dog-lovers complain that the mirror test favors visual animals like primates but makes it difficult for dogs, which are more focused on auditory and olfactory cues. Humans are visual creatures; we experience the world primarily through sight. Dogs do not. A dog's sense of smell is his main gateway to the world. This led Roberto Cazzolla Gatti, a researcher at Tomsk State University in Russia, to hypothesize that scent may be the window to self-recognition and possibly self-awareness in dogs. He developed the sniff test of self-recognition and found that dogs seemed to recognize whether an odor was their own. This sniff-test could change the way some experiments on animal behavior are validated. Gatti said, "I believe that dogs and other animals, being much less sensitive to visual stimuli than humans and many apes, cannot pass the mirror test because of the sensory modality chosen by the investigator to test self-awareness. This is not necessarily due to the absence of this cognitive ability in some animal species."